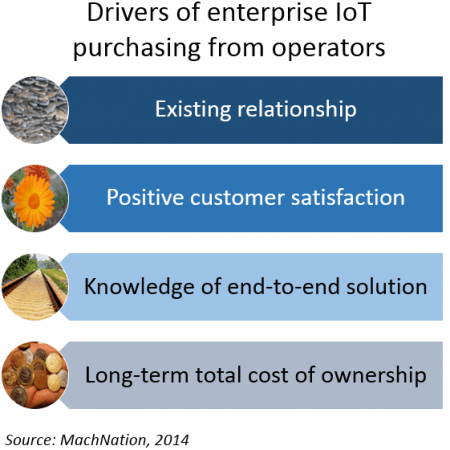 What drives enterprise IoT adoption of operator services? Based on new research from MachNation and highlighted in FierceWireless:Europe there are four reasons why enterprises purchase IoT services from communications operators. All reasons hinge on the fact that IoT solutions are complex to design, test, implement and run. Driver #1: Existing relationship with an operator. The age-old adage is true: it is easier to sell more stuff to the same customer than find a new customer. If the operator already has a long-term relationship with an enterprise, the enterprise is more willing to increase that relationship by considering an operator’s IoT solutions. Driver #2: Positive levels of customer satisfaction and customer experience. Customer satisfaction matters and those operators that have invested time and money into creating refined customer experience management processes for all customer interactions will certainly fare better in the IoT world. Driver #3: Knowledge and recommendations about the complete IoT solution. Enterprises value the input they receive from operators about the end-to-end IoT solution. Operators invest a lot of time and have great understanding of the technical issues associated with an IoT deployment. Driver #4: Relative long-term TCO of the operator’s solution. Enterprises compare the costs of IoT solutions, but it is the complete long-term cost of the IoT solution that bears the most importance, not just the cost per megabyte per month.